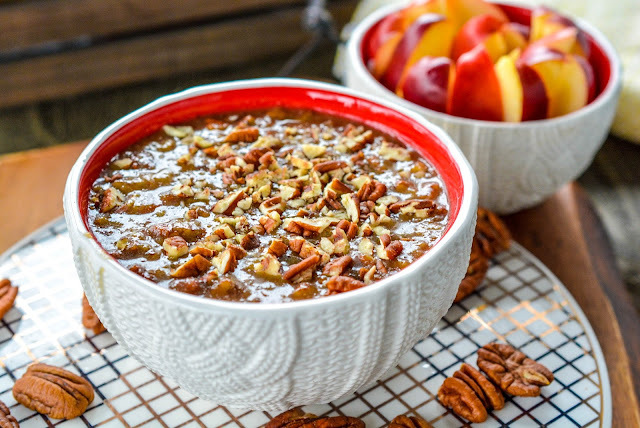 Theresa's Mixed Nuts: Homemade Praline Sauce Makes a Great Hostess Gift! Homemade Praline Sauce Makes a Great Hostess Gift! A few years ago, at a holiday party, one of Jason's friends announced that she didn't like pecan pie. For me, that was a total wtf? moment. 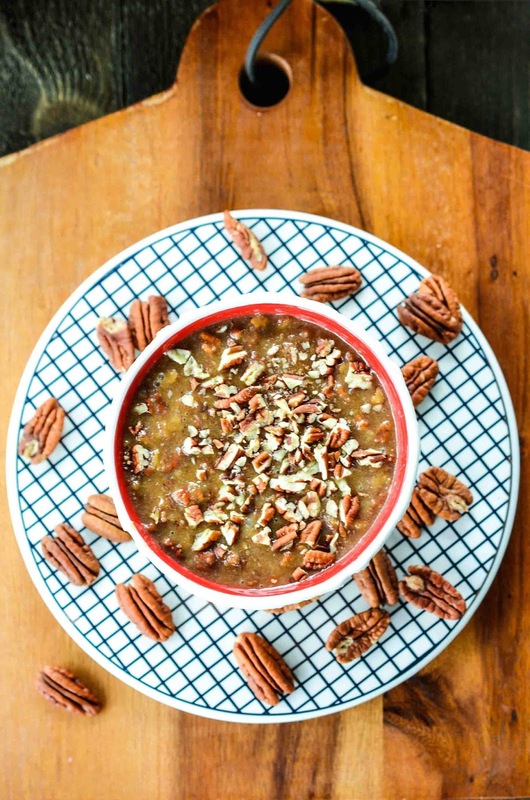 Who doesn't like pecan pie? According to her, it's just a pie full of mush. Well, yeah. Mush full of tasty goodness! Anything that has an obscene amount of sugar and pecans gets my seal of approval every time. But, I guess I can see her point. Kind of. It is a bit mushier than traditional pies and is super sweet, so I can see where it wouldn't be a pie for everyone. If pecan pie isn't your thing, but you love a good caramel and pecan flavor combo, I insist that you try this Homemade Praline Sauce! I normally make it in the fall months, but it's a sauce that is so good you'll want to have it year round. 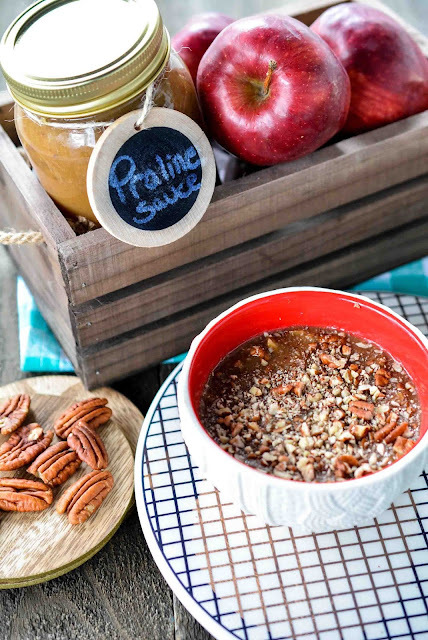 This praline sauce has an incredible caramel flavor combined with the warmth of pecans, making it an irresistible topping for pumpkin pie, ice cream, pancakes, french toast, or even as a fruit dip! Combine brown sugar, evaporated milk, and butter (do not use European butter as that will make the sauce lumpy) in a small saucepan. Cook over low heat until brown sugar is completely dissolved, about 5 minutes. Remove from heat. Stir in vanilla extract and pecans. Serve warm. Take a simple dessert and turn it into one of pure decadence! If you are strapped for a hostess gift idea during the holidays, this praline sauce is a fabulous idea! Whip it up in under 10 minutes, pour it into a mason jar, attach a little label, put it in a basket with some fruit or vanilla wafers, and you are good to go! What are some of your favorite hostess gift ideas? You ever make it to Chicago, you are more than welcome to come over for dinner or dessert any time ;) We're just an hour and a half outside of the city! Something for all year around is nice indeed. I'm with her, mushy never did it for me no matter what it is. OMG, dahlink, those white bowls that look like they're wearing white knitted sweaters are to die for! How positively enchanting! I hardly ever just splurge on myself, usually buying kitchen items on clearance, but when I saw those bowls I knew that they were meant to be mine and snapped them up, paying full price I believe. They are one of my favorite kitchen items still! I'm not a fan of taking photos, though I do love to edit and them. I much prefer the baking part of the recipes. Pictures, not so much lol. This looks so tasty! I'm pinning it. This would be great to make. This was the recipe that I was talking about the other day, where I said maybe we could use almond milk instead of the evaporated milk. I am going to try that on my next batch and see if I like it as much. That sounds so incredibly delicious. I can see using this as a topper for sweet potato casserole. YUMMM - I'm with you - I can't understand how anyone can not like pecan pie! I will definitely be trying this. Looks so good! Oh...for a hostess gift, a bottle of wine and cute wine stopper is our normal go to. Cliche, maybe...but it's simple and works. Even for people who don't drink wine (like me - I very, very rarely drink wine) it can be set out for guests at a dinner party or get-together with friends/family. I have always thought about taking wine, but since I don't drink it, I have no idea what's good and what isn't? Would a red wine be better than a white? Haha - I just guess! The only wine I ever drink is a Riesling...which is a very sweet white wine. I don't know enough about wines to know what to look for, but apparently most real wine drinkers don't like Rieslings because they are too sweet...from friends I know who drink wine, you usually can't go wrong with a Pinot Grigio (white) or Merlot (red) as a gift. I had Riesling a few years back at an event and thought it was pretty good, if I were a wine drinker that would be my pick. I guess I thought that because I'm not a real wine drinker hahaha! Thank you for the suggestions. We are hosting a Christmas gathering in a few weeks with extended family, so I will pick up a few bottles of the Merlot and Pinot Grigio to have on hand, so at least it looks like I know what I'm doing when it comes to wine lol. This looks and sounds amazing and it is a great gift idea. I usually give a bottle of wine or champagne. Oh my goodness, I need some of this in my life immediately! I have never tried praline sauce but imagine it on top of vanilla ice cream. This sounds amazing! Pinning to try it soon. I had a delicious cheesecake with praline sauce not too long ago. I bet this praline sauce would work to help me recreate that recipe. This looks heavenly. I bet this would be great to bring to a family dinner. Oh yum! This praline sauce has me drooling! I can't wait to try this! That sounds good! I would love to make this at home, it's healthy and it's perfect for movie night! You have just made my day! 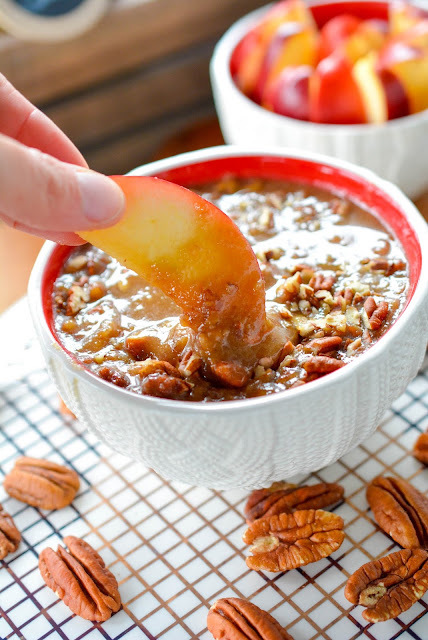 I pinned this one into my favorites and will be making it as soon as I can get pecans......There are two types of people in this world. Those who love pecan pie...and those who are soulless! This looks like the most DELISH hostess gift ever! We are all about the sweet sauces in our family and this one looks easy enough to whip up! Thanks for the inspiration! My husband is praline obsessed! This would be a great gift for him LOL! This praline sauce looks very flavorful. Have to admit, we are (especially my husband) a bit iffy on pies in general. But, I think I would like to try this mix out! This looks so delicious and easy to use. I will have to get the ingredients I need to make some this weekend. It would be a great Hostess gift. This sounds good to me. And I do like pecan pie, but I hardly ever have it. My husband would love this dip! It is perfect for the holidays and so easy to make! This looks delicious. I would love it on vanilla ice cream. It would be great on a baked apple too! I think my mother-in-law will flip over this! Pralines were always her favorite sweet when she was growing up. Praline Sauce??! Wow this looks good wow I would eat this and maybe I will make this at a holiday function! Wow this looks delicious. I would never think to gift this, but it is an amazing idea! This looks great and would make a perfect hostess gift. I will keep this in mind for the next party we attend. A pie full of... mush? Well, she's got a point there, but just say the word: pecan pie. Yum! I have never tried this kind of sauce but it looks great! I can't wait to give it a try. This looks so good! I can just imagine how amazing it tastes. I will be making this. Oh wow, does that look delicious!